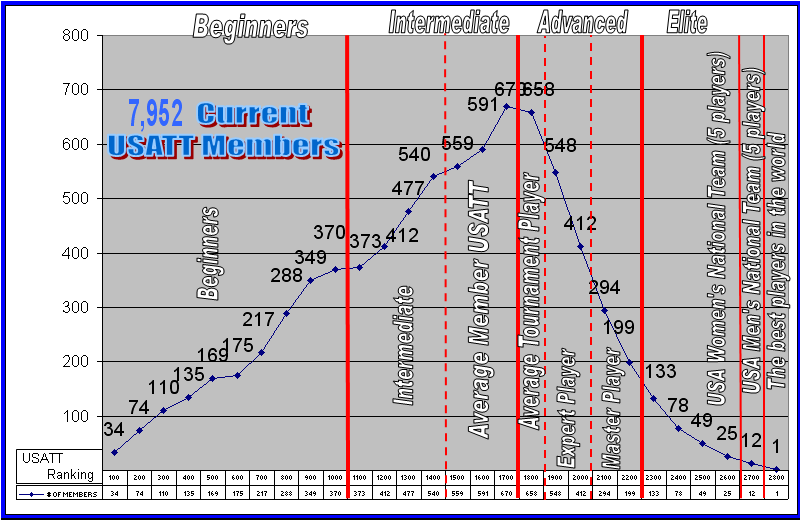 Whether you are a seasoned tournament player, or a complete novice the A.T.T.C. round robin is for you. During our round robin you will be placed in a group of similarly skilled players and get a chance to battle your way to the top. If you do well, your rating will increase and you will move up to more dificult players. You will receive a club rating using the USATT rating system and will and have the ability to track your progress online. To play Sunday Round Robin you MUST arrive and check in by 3:15 PM! To play Wednesday Round Robin you MUST arrive and check in by 7:15 PM! Unless you called in, when you arrive be sure you sign in under "Round Robin", or you will not be placed in the draw. If you are going to be late. You may call or text 510-838-1150 to check in. Please do NOT leave a long message. Simply CLEARLY state round robin, and your name. If we can not understand the message, we can NOT check you in! If you are a new player, and you do not have a USATT or Club rating elsewhere, please arrive by 7:00 pm so that we may estimate your rating. Round robin takes approximately 3 hours. Please do not sign up unless you can stay for the full duration. While we strive for accuracy, occasionally mistakes will be made while processing the round robin. If your processed results do not appear correct, please check the match sheets. If you filled out the sheet incorrectly, please be more careful next time, as we do not fix incorrectly written scores . Remember it is the winners responsibility to correctly record the score. If the scores were written correctly, and a mistake was made in processing the results, please let us know before the next round robin and we will try to make a correction. Unplayed match policy - Under very specific conditions you may be allowed to count unplayed matches as a forfeit where no points change hands. If you have a valid reason for an early departure and have it cleared with the round robin director before play, or if you have an injury or other emergency that you clear with the round robin director, these may be scored as forfeits. All other unplayed matches will be scored as if the player who left early played and lost the matches. Please record your match scores. If you do not correctly record your matches then you will NOT get credit for them! ATTC Round robin is free for players with a current USATT rating of over 2300.